I was asked by a number of people to put up the contents of today’s sermon up on the blog, so here goes. Be warned in advance – its a long one! We are in a series on transformation, a topic that most people care about yet also remain perpetually confused about. At the end of the day, most of us don’t know how to change. We want to be different, and if we knew exactly what to do to become the person we were created to be, most of us would do it. But internal transformation doesn’t work as simply as physical change. Getting trim and muscular follows a fairly predictable pattern: you need to eat better and exercise more. Its not quite as simple in the spiritual realm. Committing 30 minutes a day to studying or praying can be really helpful, but its not a sure fire formula for transformation. So, how then does a person change? This verse is at times thought of in negative terms because it seems exclusive, but that completely misses the point. If you go backwards through that verse, it is all about life. Jesus has come to bring life, and to bring life in all of its fullness (John 10.10). Jesus wants to see you live as a person who is fully alive – someone that lives at the epitome of your potential and who breathes life to the most hurting places in society. How does a person get that life? They encounter truth, which is discovered through the “way” of Jesus. Contrasting a “way” vs. a “point,” or a “path” vs. a “door” helps lance an all too common about human transformation. Many of us carry this fantasy that there is a certain moment where it all comes together. Character is refined, motives are pure, courage comes naturally, and your compass points true north at all times. Have you hit that moment yet? Similar: we think of Christianity as this door that we walk through, and we are suddenly transformed into the new being – fears gone, bad habits erased. Is that what happened to you? Thinking of transformation as a “way” we “learn” (more on that in a moment) lets the air out of that fantasy. There is no magic bullet, microwave solution, or single moment that is going to completely transform you. It’s not what the Bible ever suggests. Instead, there is a “way of life” we are meant to experience and learn. The phrase used by Paul that you can “learn Christ” has been explored and debated by scholars. This word for ‘learn’ was used to learn a language or a skill or a new job or an art form. But you don’t ‘learn’ a person. That’s now how that word was used in ancient circles, and its not how we use it now. What is a disciple? The Greek word for disciple literally translates as ‘pupil,’ ‘apprentice,’ or ‘learner.’ A disciple is someone that has given their life to Jesus, identified themselves through baptism, and has now embarked upon a way of life ‘learning’ Jesus. It builds upon the former idea – Instead of thinking of being a disciple as the finish line, becoming a follower of Jesus is the starting line and that leads to a lifelong development of connecting to the life in Jesus, growing our character, and engaging our activism in the world. I do think its important to have some type of a system to help give you some structure as you try to learn the way of Jesus. I’ve spent most of my adult life studying the different way of doing it and experimenting with them in my own life. 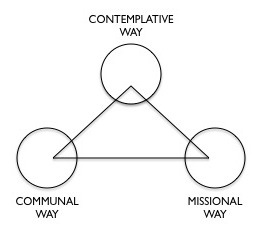 Tension 2: balance of inner and outer life – many of the contemplative traditions failed to carry the message of Jesus to the world; many of the activists failed to be connected deeply to God. Those two tensions would each be worthy of their own post. I mention them because the first book I ever read that helped me ease both of them was “Finding Our Way Again,” by Brian McLaren. I know he is controversial to some, but he is a good guy and loves Jesus. In this book he studied the practices of the different traditions and fused them together into a hybrid form of Christian practices that was incredibly helpful for me. He uses this graphic to describe the integrated nature of Christianity, and I love it! Contemplative tradition claims that we human beings can also experience and encounter the living God in this life in ways that range from gentle and subtle to dramatic, ravishing, and electrifying.